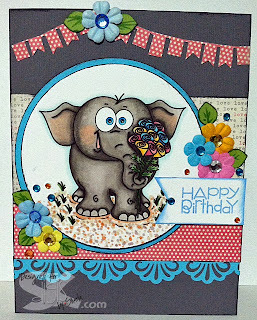 When I saw this so freakin cute elephant that Sonia has just come out with I absolutely had to make something with it! I think he is just the cutest elephant EVER! I colored him up with copics, used pattern paper, my border punch, some prima flowers, the leaves are from a punch and I just drew lines on them with my copic, the banner was actually part of the pattern paper pad that I used and hand cut, then flipped it so I had the polka dot side. The Happy Birthday sentiment is from Paper Smooches and I used orange and blue gems. I used the sketch at SKdigis Challenge for the inspiration. I hope you like it, and I hope you will check out the challenge, see what the other designers have done with the sketch and see some new digi images. 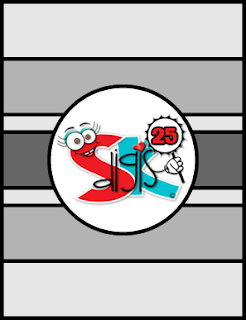 Also remember, there is a FANtastic Linky Party each month and the sketch challenge each week. There is a progressive challenge with the opportunity to receive a free digi each month. Please check it out!! Soooooooooooo cute cute cute!! I love love love that elephant and loving the colors and the banner!!!!! That is just about the cutest elephant ever! Love it! absolutely super-cute and sweet! the image makes me smile so much! What a lovely birthday card, great colours. That is one of the cutest elephants I have ever seen too. What you did with him after your gorgeous coloring is pretty special as well. Thanks for linking this adorable card up with us over at Seize the Birthday! 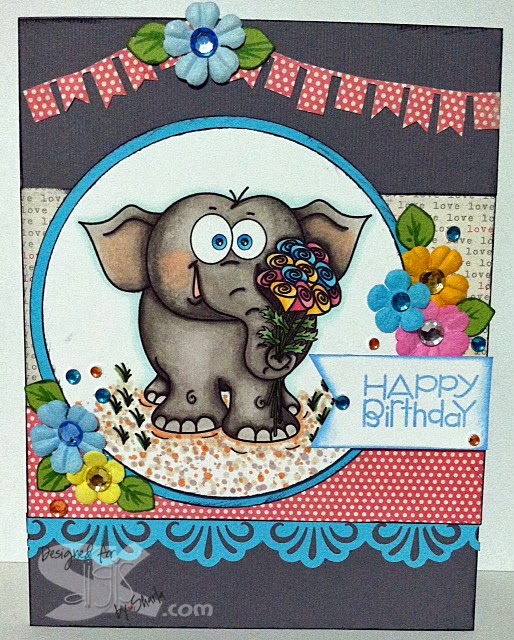 Adorable elephant on an adorable card! Definately will make someone's birthday special. Thanks for joining in the fun at HIMCR. this is so cute, sharla! love your coloring! Super cute! Thanks so much for playing along with Seize the Birthday! Oh my gosh!! Cutest elephant ever!! I love this card!! You're right....that's got to be the cutest elephant I ever did see.....love your colouring! Thanks for joining us at Lexi's Creations this time & good luck!